For years I cursed this plant, dubbing it the amaryllis that never bloomed. It finally bloomed, proving me wrong on two counts. 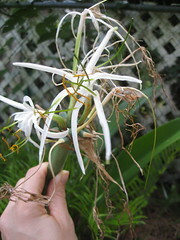 Apparently it's a spider lily (Hymenocallis latifolia) and not an amaryllis. It's not entirely surprising that I didn't know what it was. The plant tagged along for the ride when I transplanted a huge coontie plant from a friend's yard to my own. I didn't want to try digging the bulb out of the coontie, so I let it be. More than five years later, I finally know what sort of bulb it is. This is a good example of why the experts tell you not to rip things out when you move into a new house. If you can't be sure of a plant's identity, you never know what surprises might await you! Yesterday I spent part of the afternoon weeding the beds in front of the office. Don't worry--I didn't pull all of these myself! I'm dedicated, but I'm not THAT dedicated. We had about eight people who turned out to help, though Erin, Georgia, Tom and I were the only ones to stay until the project was done. 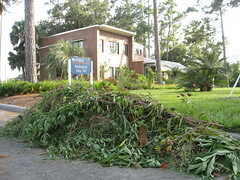 We ended up with a pile that was about two feet tall by three feet wide by six feet long. I find great pleasure in watching weeds wilt on the sidewalk after I've pulled them. It's as if I'm saying to them, "Ha! Take that! You thought you were so clever but I won this battle!" We celebrated our victory by enjoying ice cream back inside where the air conditioning was blissfully cool. And I must say, the bed looks so nice now! I smiled as I walked by it this morning. This is perhaps the last tomato that I'll eat this season from my garden. 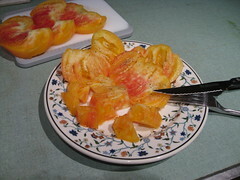 The wet weather has caused many of them to split before they fully ripen. Even this one wasn't totally ripe -- you can see the white, fibrous area near the core. There are a few green tomatoes left on the vine. We'll see how well they ripen up. The rest of the plant is looking pretty tired -- the leaves are rolling and yellowing. As much as I love to eat homegrown tomatoes, I think I'm done doting on this plant. Guess what's blooming in my garden? My 'Tropicana' canna! It's not as tall as I usually see cannas getting, but I guess that because I started this one from a bulb (or is it a corm? a rhizome? 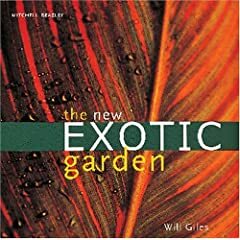 my botanical terms fail me at this point in the evening). In the past, most cannas that I've had in my yard have come as transplants, already nice and tall in their one-gallon pots. 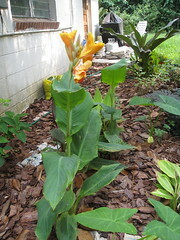 My other cannas are doing well with putting out foliage, but none of them have started flowering yet. EDIT: Apparently this is not a 'Tropicana' variety, but I don't know what it is.